Happy New Year from Japan! Thank you for the many Christmas cards and letter over the holidays. It is always nice to hear from home at this time of the year. We appreciate you thinking of us. As we start our 12th year of serving the Lord at Sakai International Bible Church, the last few months have given us many reasons to be thankful. 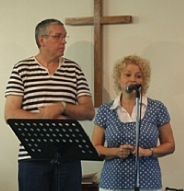 In October and November, we had a 4-part Marriage Relationship Seminar at the church. As a whole, the marriage relationship is not given much attention in Japan, so there is a great need to address this topic, especially from a Christian perspective. The seminar was lead by Leon & Robin Brill, a couple from New York who have been attending SIBC for the last several months. Leon & Robin shared many biblical principles for building strong relationships. But more than that, they also shared openly about their own struggles early on in their marriage. As a result, people not only picked up new tools for their own relationships, but they also began to let down their guard. During one Q&A session, a number of people opened up and shared about their own struggles. This is highly unusual for most Japanese, but it was a great encouragement to us. As we mentioned in our last letter, there has been a growing sense of community at SIBC, and this is just another example of how people are beginning to see the church as a safe place to be real. They no longer feel that they have to hide behind a mask of perfection, but can come to church "just as they are." We thank God for this. 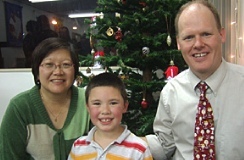 In December we held a Christmas Eve service at the church. This is usually not something that we do because most working people cannot get off work in time to attend a mid-week evening service (both Christmas Eve and Christmas Day are regular work days in Japan). On top of this, unlike in the States where many people who do not attend church during the year will attend a Christmas service, in Japan there is no such cultural tradition. So, we were expecting a very small turnout. But to our surprise, the place was completely full! It was a great encouragement to us to see the people make such an effort to celebrate Jesus. We are thankful for the hunger in their hearts. 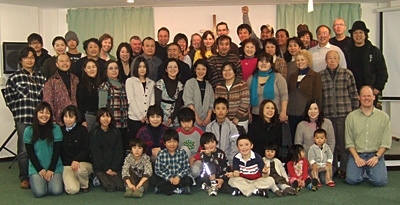 The first worship service of 2009 was a wonderful start to the New Year. Not only did we spend 60 minutes in small groups, praying and sharing communion together, but for the first time in the 20+ year history of the church we had drums! The lack of space in our sanctuary has always been an issue for us, but when someone offered to buy an electronic drum set for the church, we decided to squeeze them in. We thought that it would take time to train someone to play the drums, but it turns out that one of the gals in the church, Hiromi, is actually quite good. Who knew! So far, the impact has been wonderful. Worship is one our passions at SIBC, and now the drums will allow us to add new depth and creativity to our worship experience. In January we started a new sermon series at church called "Walking in Love." This is a verse by verse look at 1 John, and so far it has been very encouraging. The Apostle John has been pointing us to his dear friend Jesus and has been reminding us that the Christian life is not about "doing" a whole bunch of religious things, but about "being" in simple fellowship with Jesus. This is an important message for all Christians, but especially in Japan where so much of the society is based on performance. Unfortunately, this mentality has even crept into the Japanese church, and many Japanese Christians become tired of the religious rules and Christian legalism. However, after our first few weeks in 1 John, we are already seeing hearts being set free. At our monthly fellowship luncheon in January, we had an impromptu testimony time and two or three recent transfers to SIBC stood up to share. They talked about the relief of being free from performance-based "Churchianity," and the joy of learning what it means to live in simple friendship with God. Praise God! This is an exciting new journey for the church and we are looking forward to what God has planned for us as we continue our study of 1 John. 1) Please pray for growth in the worship ministry at SIBC. May our times of worship be more than just "singing songs." May we encounter Jesus each and every time worship Him. 2) Pray for our current preaching series from 1 John. May each of us grow in our understanding of what it means to walk in love with God and with one another. 3) We have recently had an increase in young children at the church (ages 2-8). While this is a good thing, we are reaching our limits in terms of space and manpower. Please pray for creative solutions. 4) The worldwide financial crisis is having its effect on SIBC as well. A number of people are feeling the financial squeeze and some have even lost their jobs. Please pray that we would learn to trust in God's unshakeable Kingdom. Thanks again for all of your prayers and support. You are a great blessing to us.